This past weekend the skies above my part of Texas were full of vintage airplanes as part of the annual Wings over Houston airshow. 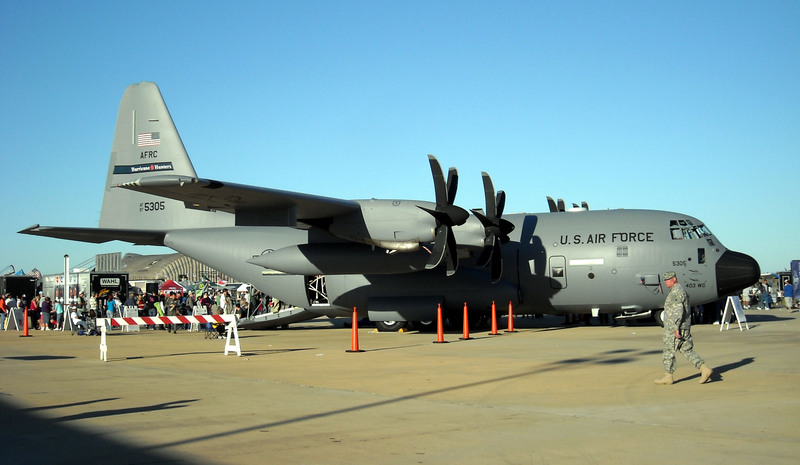 The airshow, which takes place at Ellington Field Airport, allows visitors the chance to see planes up close and personal while thinking back to an age where air power involved actual pilots and crew risking their lives for freedom and not some pilotless drone or guided missile. Nothing against pilotless drones and guided missiles but few can argue that the amount of sacrifice is the same compared to the risks taken by aviators of the past. Airshows, such as Wings over Houston, allow visitors the chance to see planes from many eras of aviation in action. I was given the opportunity to cover the “dress rehearsal” of the airshow as a reporter the first year I lived in Texas and have attended several years since as a spectator. Covering the airshow as a reporter allowed me the opportunity to “hire” my dad for the day as a photographer. My dad is the type who will stick his head out the window while driving to look at a plane overhead so I figured the opportunity for him to see the planes up close without being behind the wheel was a win/win for everyone, especially the other motorists. Plus, I was able to use some of his pictures in the paper which in turn made him a “professional” photographer. Although I was only a member of the airshow press corp one time, I still made my way back to the airshow to take in the sights and the sounds. Each year I attend as a spectator includes a walk through the static aircraft displays as well as a smoked turkey leg from the vendor area. I am not sure why it is but turkey legs just taste better with the smell of jet fuel in the air. Each time I attend gives me something new to see and enjoy and made it hard to not feel a little more patriotic and aware of the sacrifices made by all of those soldiers who came before us to give us the freedom to among other things attend airshows. Another neat thing about the airshow is that since the planes can be seen for miles in the air one does not necessarily need to purchase a ticket to see them. Granted, the ticketed experience provides much more including access to those aforementioned turkey legs but there are plenty of spots to just pull over to the side of the road and catch the show for free. Aside from planes in the sky visitors can reach out and touch planes on the ground such as this cargo plane on display during the 2009 Wings over Houston airshow. After years of being a paying customer I decided to join the ranks of the roadside viewers this year to see what their experience was like. I must admit that my roadside vantage point allowed me great access to see the planes in the sky and also included several planes flying directly above me. But even without the Blues the show must go on and from what I could tell the show was filled with the same intensity as prior years. Tora! Tora! Tora!, the reenactment of the attack on Pearl Harbor (minus the ships) is a fan favorite each year and features dogfights in the air and explosions on the ground. There were simulated bombing runs made by vintage World War II era bombers, aerial acrobatics demonstrations and of course the always popular “Tora! Tora! Tora!” reenactment of the bombing of Pearl Harbor. My grandfather survived the attack on Pearl Harbor so the reenactment holds a special place for me but even those with no connection to the attack other than being an American should be moved by the great bravery and sacrifices made by those young men and women who were thrust into that attack on that most infamous of days 62 years ago. While the weather was perfect Saturday a soggy morning of rain washed out many of the scheduled events Sunday. Aside from dealing with weather issues on Sunday, the airshow community was also dealing with a tragic loss. 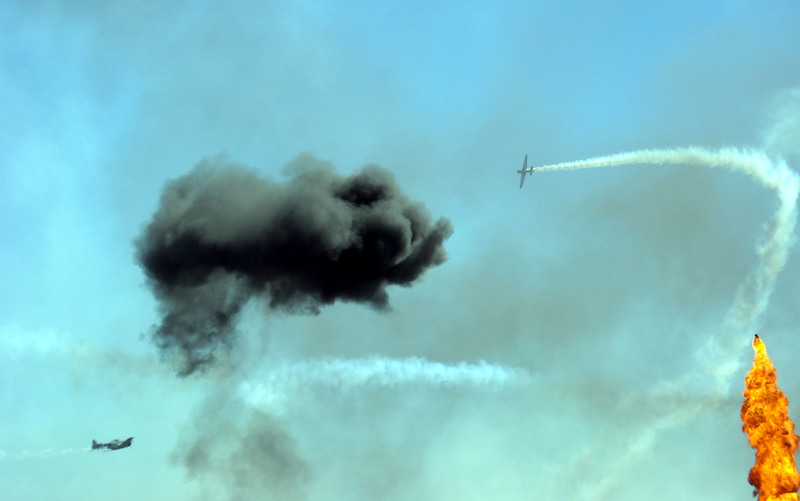 A couple of days before the airshow a pilot and passenger of a plane scheduled to perform at the airshow were killed in a crash near the coast. 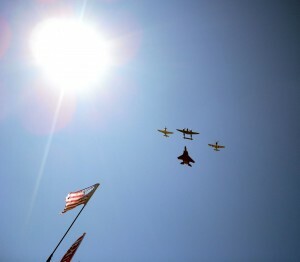 During the show a missing man formation was flown in honor of those who died but the crash showed the inherent risk associated with keeping any plane, let alone one 60 plus years old aloft. I often wonder if Orville and Wilber Wright could have fathomed what their December 17, 1903 flight at Kitty Hawk, North Carolina would usher in over the next 100 or so years. Watching the various bombers and other planes overhead during the airshow it is hard to believe that a little over a century ago man’s feet were mostly tethered to the ground in terms of the ability to sustain powered flight. So while there will always be an inherent risk to pilots and spectators alike during airshows they serve an important place in inspiring future generations while paying tribute to the generations that have gone before. After missing an entire year of performances due to the sequestration the Navy flight demonstration team known as the Blue Angels will return to action in 2014. Among the stops on their 2014 schedule is a return to Houston next November. So if you have never had the opportunity to see an airshow up close and in person I highly recommend that everyone see at least one show from either the grandstands or a nice comfortable chair on the roadside. Speaking of airshows to attend, next year’s Wings over Houston would certainly make for a good show to catch as it was announced at the end of this year’s show that the Blues would return to the skies over Houston next year. I have had the fortune to see the Blue Angels perform several times in both Florida and Texas and certainly look forward to seeing them again next year as they never disappoint. Now if you’ll excuse me, I think I hear a plane flying overhead. Last week I went to the doctor for my annual physical. Over the past few years the actual time spent seeing the doctor has decreased while the amount of time waiting in the lab area for the drawing of blood and the giving of urine has increased. Now, I know that the urine and blood are the areas that give the doctor the most data in terms of how my internal organs are functioning so I don’t mind waiting for the technician to call my name. I just wish that the doctor could pretend to spend a little more interest during the face to face time. The waiting room at the lab and x-ray area features comfortable chairs, a television, and a couple of tables with some lamps and other standard waiting room furnishings that are most likely featured in doctor’s offices the world over. And upon a cursory glance all seemed normal with the furnishings in this waiting room. Upon closer inspection some disturbing facts came to the surface though. Each of the lamps in the room were not plugged in and appeared to be placed on the tables merely as decoration items. My attention was first drawn to the lamp to my left that featured the power cable wrapped around the base. The lamp to my right tried a little harder with the charade by having the cord go down to the ground to look like it was plugged in. Of course even if someone wanted to plug in the lamps they could not since there were no power outlets visible anywhere in the waiting room. Did the designer of the room think that the tables would look out of place without lamps on them to the point that they were deemed necessary even without any means to power them? Call me crazy if you’d like but I always thought the purpose of a lamp was to shed light on an area first and to act as a decoration second. I know that just like the perfect rug can really tie a room together the perfect lamp can add that certain design touch as well. For years I have had a lamp that is shaped like a fish and have even had a few people comment about how cool it looks. While lamps come in all shapes and sizes their first purpose should be to give light. 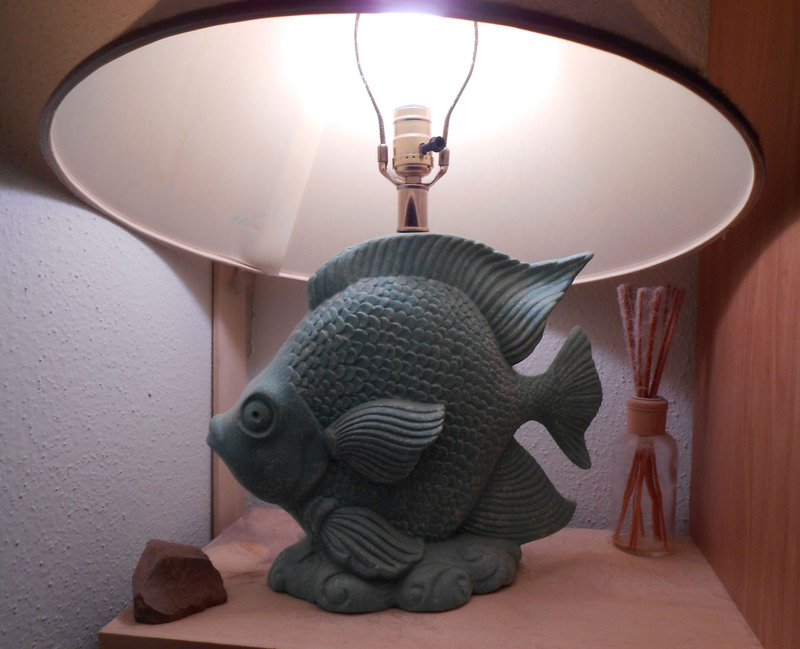 And I think that my fish lamp is nice to look at but I also enjoy that fact that the lamp is plugged in and provides me light to read by. Granted, I never went to interior design school unless you count years of watching “Trading Spaces,” “This Old House,” and “While You Were Out” on television but I would never think of not plugging in a lamp. So as I sat there in the waiting room looking at the lamps that did not illuminate I thought of Monty Python and F. Scott Fitzgerald. So as I stared at the lamps in the waiting room I wondered what other smoke and mirrors were being employed by my health care provider as a means to make patients feel comfortable as long as they did not look too far beneath the surface. Aside from thinking of Monty Python the lamps brought me back to the Roaring ‘20’s, or at least a book about that time period. 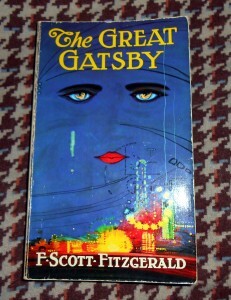 In the book the “Great Gatsby,” there is a pivotal scene in the library involving The Owl Eyed Man and Nick. 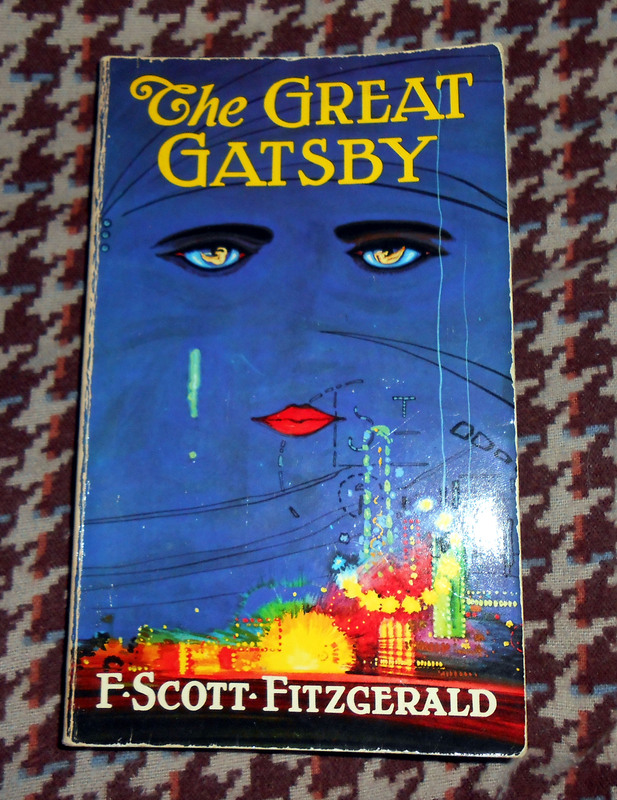 The scene revolves around the fact of the Owl Eyed Man’s amazement that the books in Gatsby’s library are real as opposed to being merely cardboard copies of books as was the custom of the time to make one look more read than they really were. As the time period was about keeping up appearances one with a library of books would seem more learned than someone without books. Once upon a time before the internet my mom and I had a debate about the books in “Gatsby” and whether they were real or fake. The Owl Eyed Man and I both know that the books in Gatsby’s library were real and served a function unlike the lamps in a certain waiting room. 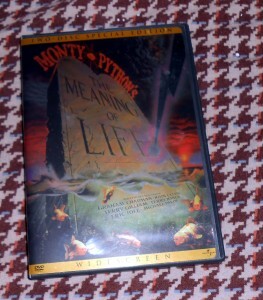 At the time it had been years since either of us had read the book but I held firm to my belief that the books were real while my mom was convinced that they were fake. Today one can find hundreds of opinions on the matter by just entering a web browser search but back then in the pre internet world we had to dig a little deeper for answers and sometimes actually had to physically go beyond the walls of our own homes. Upon informing my mom of this fact she countered that later in the chapter it is determined that while the books are real they had not been read since they had not been cut open as was the custom of the day. Still, to this day I claim the victory of paying attention enough in English class to recall the most trivial detail about the “realness” of the books. 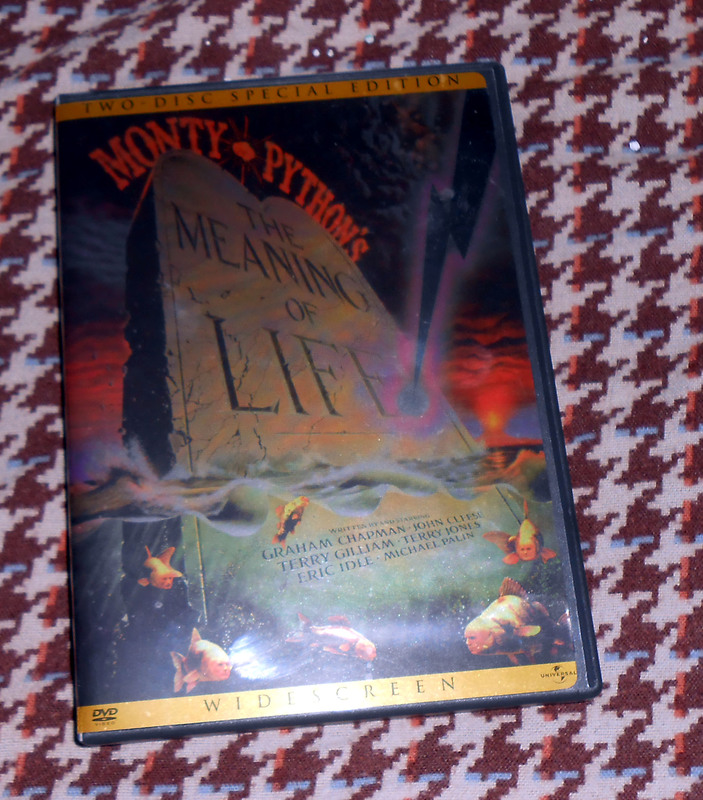 So two lamps in a waiting room, and hunger from fasting, made me recall British comedy and one of the great American novels of the 20th Century. While I am sure that the person who put the lamps there did not think that it would lead to such deep thoughts for those stuck waiting on their names to be called to have blood drawn I must admit it did make the time go by a little faster. Now if you’ll excuse me, I have to go call the doctor to get my results from the machine that goes ping. So far the NFL season has been one for the ages. Whether it will be remembered as a good age or a bad age is still a matter of debate. With a series of teams battling for the number one draft pick next season it seems that there is very little good to say about the play of a quarter of the teams in the league as the season nears the halfway point. Currently 7 of the 32 teams in the NFL have won less than two games. Conversely only four teams have one loss or less showing a huge divide between the haves and the have nots. Aside from being a season of poor play by a quarter of the league the 2013 NFL season has turned into a season of last quarterback standing with several teams already using their third or fourth quarterback of the year. Some quarterbacks have been replaced by injury, while others have been replaced by poor play. One quarterback was even cut by one team for poor play and then injured the following week for an entirely different team. With more openings for good quarterbacks than available good quarterbacks, teams have had to get creative with filling the vacancies. Let me just say that with so many quarterback slots open I find it appalling that Tim Tebow is still unemployed with no team seeming to be willing to hire the former Heisman winner who happens to have more playoff victories for the Denver Broncos than Peyton Manning. While no one has called to offer Tebow a job apparently a call was made to another, albeit slightly older, former Jets quarterback. 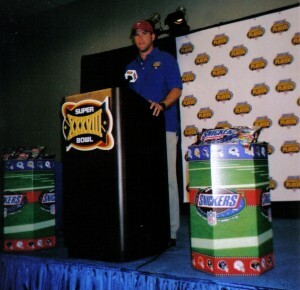 Brett Favre, shown here during an event for Snickers during Super Bowl XXXVIII made some people snicker when it was leaked that the St. Louis Rams were interested in the twice retired quarterback. For the record, Favre said no. I am of course talking about Brett Favre the man who seems to retire and unretire more times than Andy Pettitte. If published reports are to be believed the St. Louis Rams reached out to Favre, who last played three seasons ago for the Minnesota Vikings, to see if he was interested in coming out of retirement once again to fill-in for Sam Bradford who is out for the year following a knee injury. 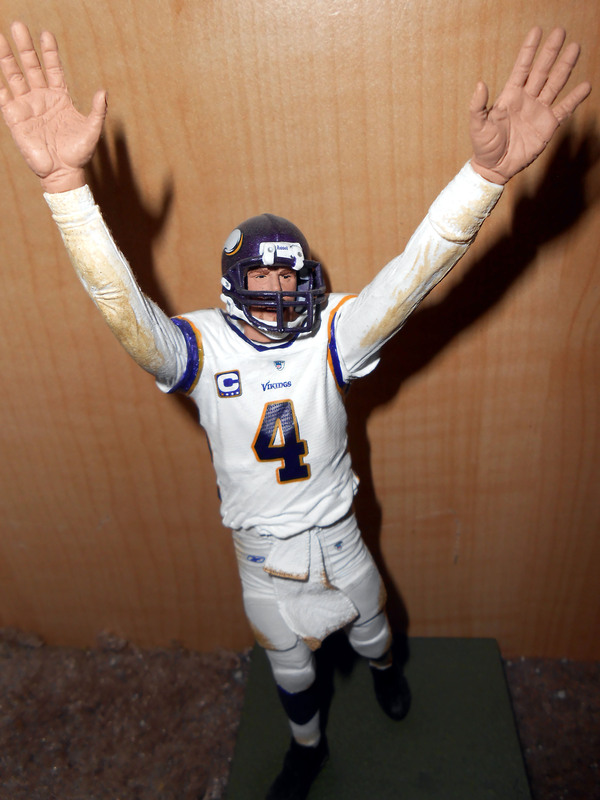 It should be noted that Favre’s former team the Minnesota Vikings could also use some help at quarterback after blowing through four quarterbacks of their own so far this season. For the record, Favre shocked many people by saying that despite still being in shape to play football he was happy to stay retired in Mississippi where he serves as a volunteer head coach for a local high school. While that could certainly be code for “offer me more money and I will play for you,” I tend to believe that Favre is finally done this time. But the very fact that a 44-year-old “retiree” is considered better than any other option of free agent quarterback available speaks volumes for the state of quarterbacks in the NFL. That also shows why with only one true franchise caliber quarterback projected for next year’s NFL draft the battle for the first overall pick is going to be intense. Brett Favre, shown in plastic miniature form, last played in the NFL in 2010. The fact that a team wanted him to play again in 2013 shows just how bad the crop of quarterbacks is this season. While I doubt that any team near the bottom of the standings right now would tank the rest of the season in order to get the number one pick there are certainly a number of teams who are in desperate need for a franchise quarterback. And for those teams looking for a retiree in their 40’s to lead their offense there are options there as well. Although Brett Favre has said no to a return, former Four-time Pro Bowl quarterback Jeff Garcia, who has not thrown a pass in the NFL since 2008, has offered his assistance to several teams. While I have never been involved in fantasy sports leagues I have got to think that the quarterback shuffle has been very hard for those fantasy team owners. Of course the lack of strong quarterback play has been difficult for those real team owners as well. With so many quarterbacks injured and so few options to replace them it will be interesting to see how the rest of the season plays out. 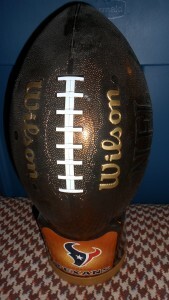 And who knows Tim Tebow may yet get another chance to show what he can do. Now if you’ll excuse me, I am off to throw the football around in case the depth charts get further depleted and teams start auditioning arm chair quarterbacks. Tonight marks the start of the 2013 World Series pitting the National League Champion St. Louis Cardinals against the American League Champion Boston Red Sox. With the American League winning this year’s All-Star Game, home field advantage falls to the Red Sox which means that Fenway Park will be host to yet another Opening Game of the Fall Classic. The fact that the Red Sox made it to the World Series and have home field advantage should not be that big of a surprise to anyone who paid attention to the standings this year. For most of the season the Red Sox were the most dominant team in the American League. And as champions of the American League East they played one of the toughest schedules in all of baseball with numerous games against the Baltimore Orioles, Tampa Bay Rays, and New York Yankees. It should almost be a given that the winner of the American League East goes directly to the World Series each year since the competition in the division is that tough year after year. After winning the East the Red Sox still had to defeat the Tampa Bay Rays in the American League Division Series. While the Red Sox were the best team in the American League for most of the season the Cardinals were setting the pace in the National League. So while many times the best teams do not always make it to the World Series few could argue that the most dominant teams from the past season made it to the ultimate championship round this year. And while I pretty much gave up watching baseball this season when the Rays lost in the Playoffs, I will likely tune into the World Series. That is the magic of the World Series where people watch the games for the history and the excitement regardless of what teams they follow during the regular season. And while I will watch the World Series I have yet to decide who I will be rooting for. Nothing against either the Cardinals or the Red Sox but they really just are not teams that I can get excited over. I do not have ties to the New England region or the Midwest so there is no geographical link that would pull me one way or the other. Also, can I in good faith root for the team that eliminated my team from the Playoffs? There are some that say that rooting for the team that eliminates your team allows you to say that your team lost to the eventual champion so that is a good thing. There is another school of thought that says to root for the team that did not beat your team since one doesn’t want the team that knocked out their team to be crowned champion. Of course there are other factors at play that would have some conspiracy theorists saying that the fact that the Red Sox are in the World Series has less to do with them playing better than the other 14 teams in the American League and more to do with the Hollywood element of what happened in Boston a few months back and the need to wrap things up with a pretty little bow. For those who may have forgotten there was an attack during the Boston Marathon this year. Following the attacks, the Boston Red Sox became a symbol of the region’s resolve and determination to fight back against senseless attacks. Throughout Major League Baseball teams showed their solidarity for the people of Boston by among other things playing Sweet Caroline, a Fenway Park eighth inning staple in their ballparks as well. As if that weren’t enough, there were even live performances by Neil Diamond pretty much everywhere you looked. And of course there was David “Big Papi” Ortiz standing on the field at Fenway reminding people whose town it was with colorful language that any other time would have garnered a fine from the FCC for obscenity but was deemed okay as heat of the moment impassioned speech. So with all of the factors listed above some would have just said then and there that the other American League teams were foolish if they thought that anyone other than the Red Sox would be in the World Series. In fact I mentioned to several friends at the time how I figured that the perfect ending to the season in most people’s minds would be a Boston Red Sox Championship. The only question remaining was which parts would Mark Wahlberg and Ben Affleck play in the inevitable movie about the Red Sox bringing the people of Boston together. Of course the last time the Hollywood ending was put in play during the World Series it did not really go to plan. Following the 2001 terrorist attacks in New York, the Yankees made it to the World Series with even the biggest of anti-Yankees fans pulling for them since they represented the region and carried the memories of both those who had perished as well as those who were trying to rebuild their lives. The Yankees were even given permission from Major League Baseball to wear special caps honoring the fallen police and fire fighters. In the Hollywood version of the 2001 World Series the Yankees would win in four games and the nation would rejoice and start the healing as Major Rudy Giuliani declared it Yankees day. In the actual World Series of 2001 however the Arizona Diamondbacks were victorious in seven games proving that the Hollywood ending does not always happen the way people expect it to. Fast forward to this year and the stage is once again set for a Tinsel Town take on the Classic. Of course there is still the whole matter of needing to play the games first to see who comes out on top. So, time will tell whether the 2013 World Series ends with a Red Sox victory and ensuing Hollywood treatment or if it is another example of the underdog team winning against the will of all of those proponents of fate. The only thing that is certain is that there will likely be mentions of the Boston Marathon attack tonight and there will be Neil Diamond; lots and lots of Neil Diamond. Now if you’ll excuse me, I have some baseball to get ready for. This morning I was greeted by both the sound of 3,000 government employees returning to work at the Johnson Space Center after the government was reopened as well as a crisp fall morning with temperatures in the 60’s. With temperatures still hovering in the 80’s and 90’s most days the little taste of fall was a welcome if brief occurrence. I am sure that the local news crews interviewing all of those returning space workers also appreciated the cooler temperatures as they toiled on their “local impact of government shutdown” human interest stories. In terms of the cooler weather’s effect on me, I have noted before that fall is my favorite season of the year. 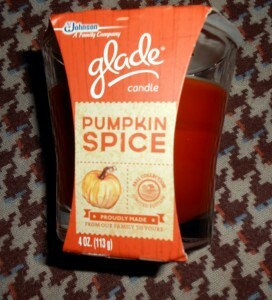 Tis the season for the festive fall scents. I love the smells of the season and the changing colors of the leaves. 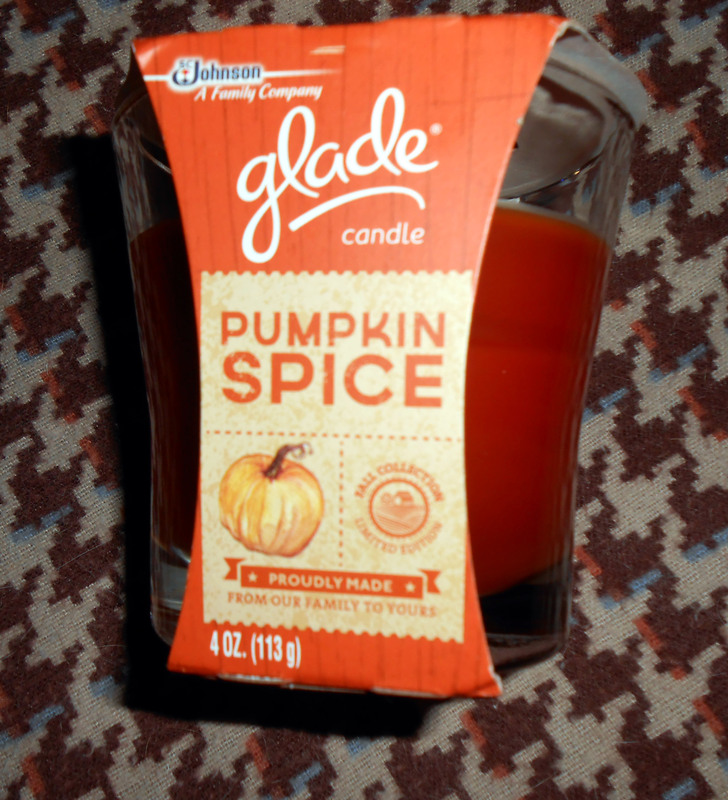 I love that all of the pumpkin inspired hot and cold beverages are available in the stores. And of course when I was younger I loved that fall meant that presents under the tree for Christmas were just that much closer to becoming a reality. Okay, so I still like the fact that fall means December is that much closer. So while there are myriad reasons why I love fall it is also a season full of memories of things that one just can’t do in Florida and Texas. When I lived in Maryland I would spend fall days jumping in piles of leaves and going on nature hikes. Fall was also the time where a school field trip to Butler’s Orchard in Germantown, MD allowed me to pick the perfect pumpkin right out of the field where it was grown and stock up on some tasty apples. The lack of access to a pick your own pumpkin patch is likely one of the reasons why I no longer carve my own pumpkin. Once you have picked an almost as big as you pumpkin that is still attached to its life giving vine and wrestled it onto the school bus, anything else just does not seem right. I mean nothing against those pumpkin patches in front of churches and the pallets of pumpkins at the local grocery store or big box store, but I prefer to pick my own pumpkin when given the choice. As I was walking outside today thinking of pumpkin picking memories of falls gone by, it occurred to me that the cooler temperatures would make for a great excuse to have some warm comfort food for lunch. So with my appetite in tow I went to one of my favorite local diners and ordered some shrimp and grits. Of course what I really wanted was some Maryland style crab cakes but as I had noted recently with another uprooted Marylander there just really aren’t any places to get good Maryland style crab cakes in Texas. 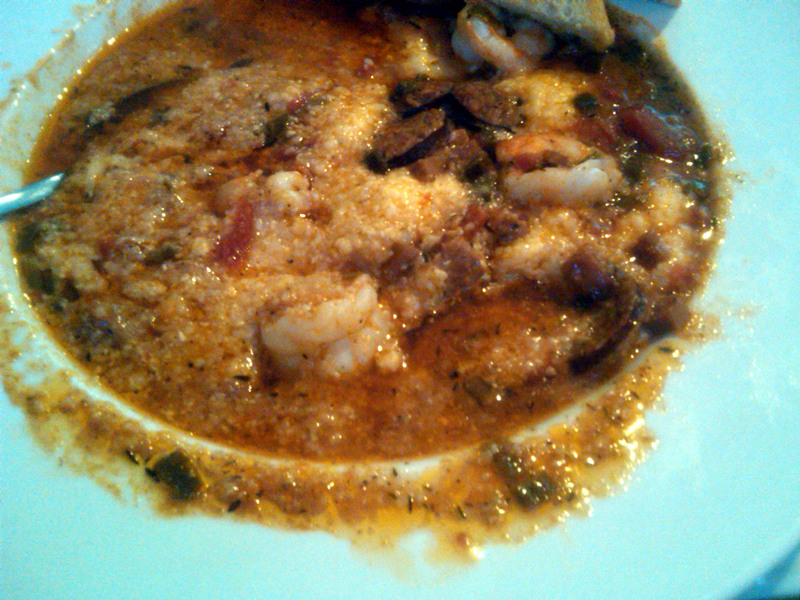 Shrimp and grits hit the spot during the first “cold” day of the year. For the record this particular diner where I was having the shrimp and grits makes a pretty tasty New Orleans style crab cake. When my shrimp and grits arrived in all of its steamy flavorful goodness it felt like fall. There were gray clouds outside and warm food inside. I tried to tune out all of the people walking outside in shorts and told myself that it was cold outside and the clouds were snowy reminders of that. Several of the diners around me had similar cravings for the flavors of fall as at least one person at every table was ordering soup of some kind. Of course I did not just end with my warm bowl of shrimp and grits. I continued the fall food bonanza with some warm pecan pie. Unlike pumpkin pie which I can only eat during the fall and winter months, pecan pie tastes good year round. But pecan pie when there is a bit of a chill in the air tastes even better. In reality it was barely cold enough outside to justify eating shrimp and grits but we are not afforded many cold days in this part of Texas so we have to take advantage of them when we can. That is also the reason why temperatures dipping into the 70’s can be cause for some people to grab that coat or jacket that has been stuck in the closet all year. After all, one never knows when they will get to wear it again. I realize that right now all of the readers from parts where it is less than 60 degrees for 7-8 months out of the year are probably laughing at the Sunbelt dwellers and our version of “cold.” It is the same way that someone from Hawaii would get little sympathy for complaining about a cold day of 80 degrees. Some of you are even saying that if we love the cold so much why don’t we move to areas where we can take advantage of it more? I can only speak for myself when I say that as much as I enjoy the cold, I enjoy it in the doses that I have now since no one wants to be sitting out on a beach chair when it is 50 degrees out. So I will continue to enjoy the small tastes of fall and winter as they arrive here to help break up the 10 months known as summer and not as hot as summer. Now if you’ll excuse me, I think it is time to make some hot chocolate before the temperature goes back up to 90 degrees tomorrow. Sunday afternoon the Houston Texans did something that they had done for the previous three weeks, they lost a game. At 2-4 for the season it is highly unlikely that the Texans, who some had predicted as a Super Bowl team, will even make the playoffs this year. Such is the nature of sports. You win some. You lose some. And until the game is played one does not know which side of the coin one will fall on. Sure there are sports like soccer where the outcome can just as easily be a nil to nil draw, but by and large the stick and ball sports that most Americans follow end with a winner and a loser when all is said and done. With this clear distinction of only two outcomes, it stands to reason that a team on any given day has an equal opportunity to either win or lose. Of course there is a whole industry from fantasy sports to the betting houses in Las Vegas that try to guess the outcome ahead of time but they are not always successful since no one can predict with 100 percent accuracy what will happen once the players take the field. This brings us back to the Texans who by most accounts are falling well short of expectations for the season. By most accounts the Houston Texans are having a disappointing season. The reaction of some fans however is even more disappointing. People are blaming coaches and players for the losing streak with some fans even calling for people to be fired or worse. This came to a head during the game Sunday when the Texans quarterback left the game with a leg injury. Now, this same player had led the Texans to the postseason last year but he is off to a rough start this year and even set a NFL record with four consecutive games where he had a pass intercepted and returned for a touchdown in a play known as a pick 6 which got its name from the fact that the interception, or pick, results in six points for the opposing team. So when the Texans quarterback was down on the ground in pain there was a vocal group of fans in the stands that were cheering the injury since they felt that it would mean a new quarterback would enter the game and lead the team to victory. 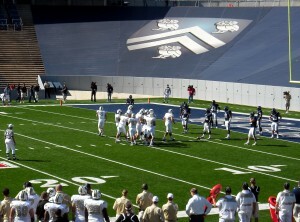 Instead the new quarterback entered the game and threw, you guessed it, a pick 6. So it seems that the Texans issues are not limited to a single player having an off year and point to more of an institutional off year which teams do tend to have from time to time. Of course any sane person could see that since rarely does one player win or lose a team sport. 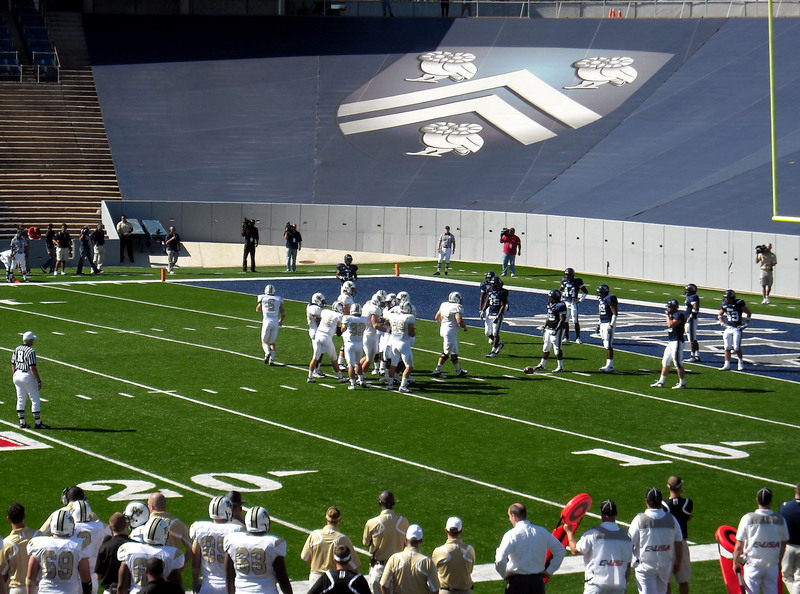 It takes the entire team working on both offense and defense to secure a victory. Still, there are those extreme fans who fixate on a single player as the cause of all of their issues. Normally this just involves yelling at the television but in some cases it can turn violent. While there have not been any reports of Texans fans getting violent towards any players yet there have even been reports of fans driving by the quarterback’s house and confronting his family. 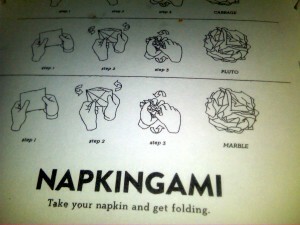 That is taking things too far. No one, regardless of their profession, should have to deal with people harassing their family members. Remember it is just a game. The athletes are paid to entertain us and to give their all during the game. They do not owe us anything during their off time and cheering for someone to get injured harkens back to something out of the Roman Coliseum days. We have moved beyond those days although I am not so sure that everyone in society made that trip and we do seem to be reverting back to a more barbaric society. Of course there is time to stop that trend and return to a more civilized sporting environment. Watch the games, enjoying the effort but don’t take it too far to the point of cheering for someone to get hurt just because they threw some interceptions. 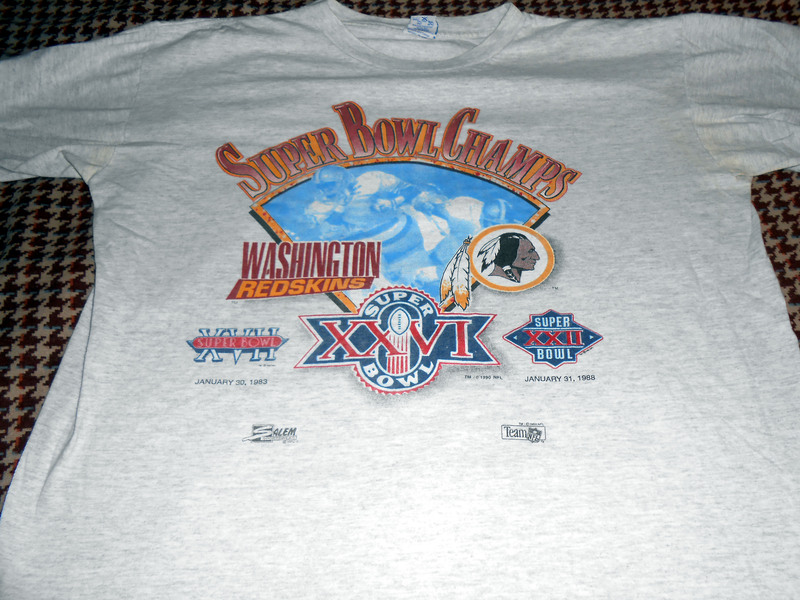 From 1982 to 1991 the Washington Redskins went to the Super Bowl four times, winning three times against the Miami Dolphins, Denver Broncos and Buffalo Bills. 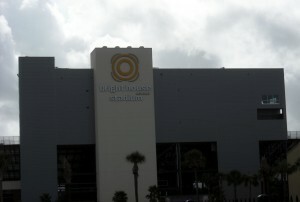 The second of those four appearances resulted in a loss to the Oakland Raiders. The Washington Redskins went through a period where winning the Super Bowl each year became expected. With the last title coming over 20 years ago it has become clear that winning is not guaranteed. Some fans of the Houston Texans are still trying to learn that after a couple of trips to the playoffs. So as a fan of the Redskins during that time, winning it all sort of was expected despite the fact that only one team can win it all each year. It is sort of the way that fans of the Dallas Cowboys, New York Yankees and New England Patriots expected to win it all every year during the dominant years each of those franchises had. During the 1985 or 1986 season I was watching a Washington Redskins game with quarterback Jay Schroeder behind center. Schroeder became the starting quarterback for the Redskins following a career ending leg injury to Joe Theismann. I mention this to point out that Theismann was a Hall of Famer and Schroeder was a backup at best who was thrust into the limelight due to an injury. Of course yelling at the television did not accomplish anything other than causing me to break the ring I was wearing at the time from the force of my hands going together. From that moment on I employed a strict no breakable jewelry during games policy but I also vowed to watch sports with a little less emotion. Of course emotion is good when watching sports. I am definitely not saying to not cheer when one’s team does well. I am merely saying don’t jeer as much when they are doing poorly. Yes, athletes are paid a lot of money to do what they do and very few people are as skilled at those sports. But those high paid athletes are also husbands, fathers, sons, daughters, wives, etc. I have mentioned before how much I cringe when I attend a game and see a father teaching their son or daughter how to heckle an opposing player. The next time you find yourself inclined to do that consider how you would feel if you were on the field and someone was saying that to you. Better still picture your son or daughter as a professional athlete and think about what it would be like to have them heckled. I don’t buy the whole athletes have thick skin argument. They are flesh and blood just like the rest of us. The only difference is they can run and hit faster and further than the rest of us. Time will tell what becomes of the Houston Texans this season and I certainly hope to avoid rabid fans as I go about my daily life but something tells me things will only get crazier. I just hope that they don’t turn violent. Now if you’ll excuse me, I have a craving for some cheese and saltine crackers for some reason. Today is Columbus Day observed across the United States. Not even a partial government shutdown can stop the day set aside to honor the 15th Century explorer. I am sure most of us recall from the story how Christopher Columbus sailed the ocean blue in 1492 and “discovered” the new world. Of course there were already people living in the new world when Columbus arrived and scholars often debate the timing of the arrival of vikings in terms of who really arrived from Europe first, but for our purposes here let us just agree that it was old C.C. Now, in addition to learning about the year of the arrival of Columbus students are also taught from an early age the names of his three ships that accomplished the journey. These ships were of course the Niña, the Pinta and the Santa Maria. Growing up my parents had models of the three ships that Columbus sailed. From the scale of the models as a kid it was hard to determine how large the ships were in reality. Still, even my younger me mind envisioned the ships to be much larger than they were. 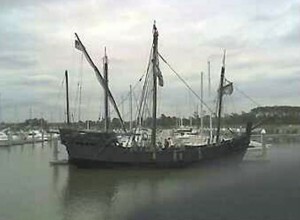 A few years back I had the opportunity to visit a replica of the Niña when it was berthed in the Houston Ship Channel. What struck me the most about the ship was how small it was. While I was picturing something more along the lines of some of the tall ships I had seen in ports along the Atlantic Coast the Niña and her ship sisters were more along the lines of being large yachts by today’s standards. 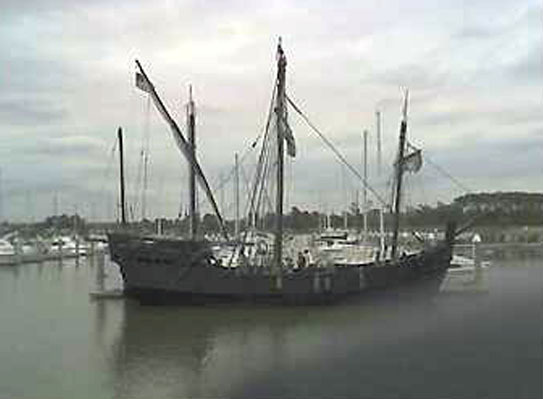 A replica of the Niña as seen in the Houston Ship Channel a few years back. The ship travels to ports in the western hemisphere as a floating museum and is a must see for anyone who gets the chance. Considering the size of the ships that make cross Atlantic journeys today it is hard to imagine courage that it took to travel into unknown waters in such a tiny ship as the ones used during the Columbus voyages. Still, despite the smallness of the ships they were able to get the job done and helped introduce Europeans to the new world. Of course whether that was a good thing or a bad thing is certainly something that tends to get debated as well. But let us assume that most of us would not be here were it not for the age of exploration. On August 3, 1492, Columbus and his crew set sail from Spain in the three ships and made landfall on October 12 on one of the Bahamian islands. Columbus sailed from island to island in what we now know as the Caribbean, looking for the “pearls, precious stones, gold, silver, spices, and other objects and merchandise whatsoever” that he had promised to his Spanish patrons, but he did not find much. 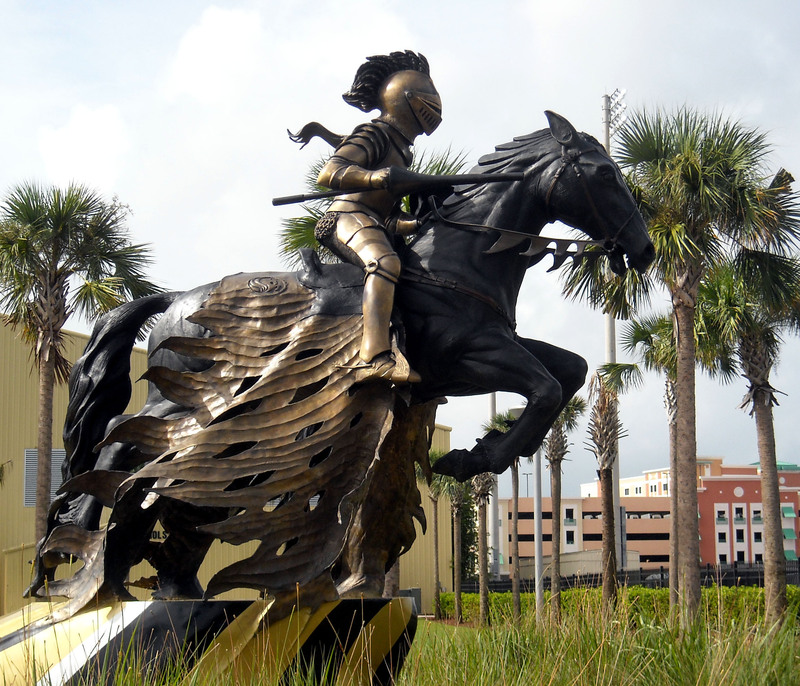 In March 1493 Columbus left 40 men behind in a makeshift settlement on Hispaniola before returning to Spain. While the first trip in 1492 gets the most acclaim what is often forgotten is the fact that Columbus made four trips across the Atlantic Ocean from Spain. In addition to the aforementioned 1492 journey, trips were made in 1493, 1498 and 1502. Columbus was determined to find a direct water route west from Europe to Asia, but he never did. Although the trade route was never found, his journeys marked the beginning of centuries of trans-Atlantic conquest and colonization which ultimately led to the founding of America. With such a momentous set of dominoes put into place by the voyage of Christopher Columbus it makes me wonder why the holiday isn’t given more attention. I mean July 4th is deserving of fireworks because it was when America gained its independence from Great Britain. New Year’s Day gets fireworks because it is the start of a new year and I guess that was deemed fireworks worthy. I maintain that there should be fireworks on Columbus Day as well since in a round about kind of way there likely is no America or even Canada as we know it without Christopher Columbus. Instead of just another day to have deals on cars and appliances as all minor American holidays from President’s Day to Memorial Day have turned into, Columbus Day should include floats, parades and fireworks. That is unless we all would rather still be living in Europe. Now if you’ll excuse me, I think it is time to go pay a Columbus Day visit to those three models from my youth and see if I still have any fireworks to set off tonight in honor of the man who paved the way for the man who first stepped foot in what is now America. 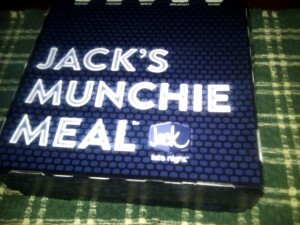 A few weeks ago the fast food chain Jack in the Box introduced Munchie Meals. The Munchie Meals are only served from 9 p.m. to 5 a.m. and cater to a certain demographic that is awake and hungry during those hours. Fast food chain Jack in the Box recently unveiled the Munchie Meal for those people who prefer to get all of their daily calories between the hours of 9 p.m. and 5 a.m. This follows the trend set by Taco Bell’s Fourth Meal campaign and other restaurants as a way to drum up business during non traditional hours. In the same way, certain restaurants such as Sonic offer a Happy Hour of sorts from 2 p.m. to 4 p.m. where they have a menu of items at a reduced price to entice people to spend money during normally slow hours between the lunch and dinner crowds. As for the trend to entice people to eat during the overnight hours one can assume that the demographic is mainly college students and shift workers. When I worked for newspapers I often worked until 1 a.m. or later and found the selection of places to grab a bite after work to be rather limited. 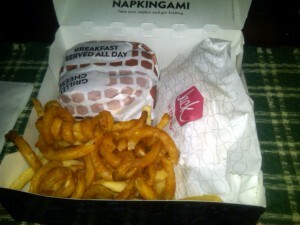 Were the option of Munchie Meals available back then I most likely would have made it part of my driving home routine. An interior view of the Munchie Meal reveals assorted fries, tacos and one of five special entrees. It should be noted that one Munchie Meal includes more calories than the total daily recommended amount. So they are certainly not intended for the healthy eater and those watching what they eat. Instead the Munchie Meals offer a smorgasbord of tasty but bad for you selections that are covered in various cheeses and/or deep fried to a golden tasty perfection. 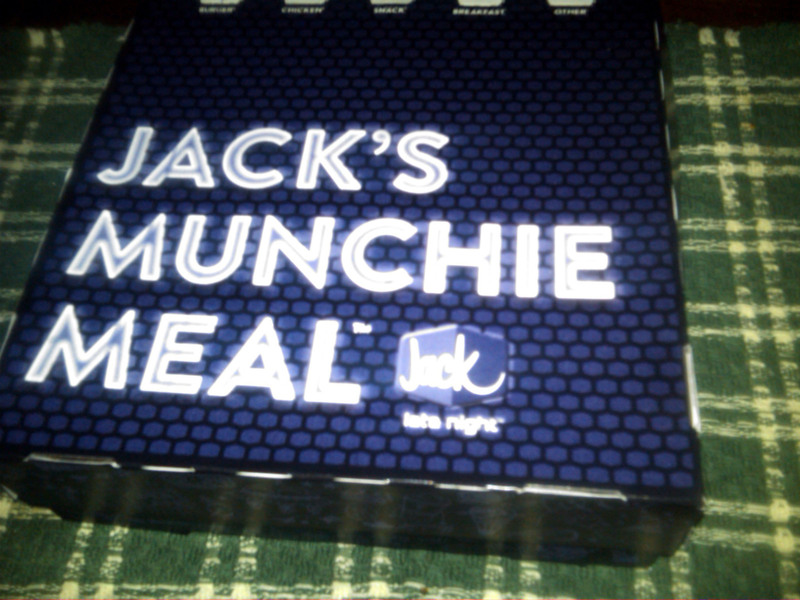 For convenience and portability sake the Munchie Meal comes self contained in a box. Right about now some of you are probably craving a Munchie Meal while there are others who are wondering if the prize inside the box is an automatic defibrillator. Having looked inside the Munchie Meal box strictly for research for this column I can assure you that the automatic defibrillator is not included but could probably be ordered as an add on. 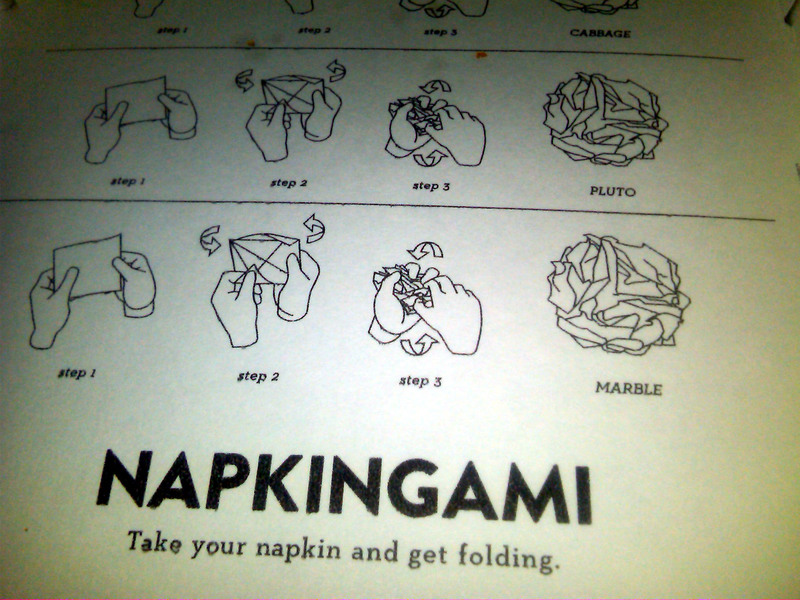 As if thousands of calories was not enough entertainment to keep one occupied the Munchie Meal teaches the ancient art of napkin folding as well. With the introduction of the Munchie Meal Jack in the Box, like Carl’s Jr. before it, is giving consumers what they want in the form of thousands of calories in a convenient carrying case. It is not necessarily giving consumers what they need however since very few people could argue that anyone needs that large of a calorie hit during the overnight hours. So while the battle rages over wants and needs and whether the Munchie Meal is good or bad for the nation as a whole one thing is certain Denny’s, Waffle House and IHOP have been put on notice as there are now more choices vying for those late night diners. Now if you’ll excuse me I need to take a nap so I can be awake in time to get my Munchie Meal later. For the most part I try to steer clear of discussing politics. It is not that I do not follow the political system. Quite the opposite, I am rather informed and involved in the government process and try to stay on top of current events as much as possible. I am also a big history buff and believe that one must learn from history in order to avoid repeating the mistakes of the past. 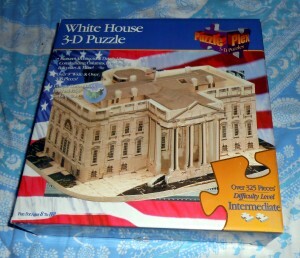 The government is a lot like a puzzle. It takes a lot of pieces going together to work but it only takes a single piece to be missing to make the whole thing fall apart. The reason for steering clear of political writing is simple. Were I to write about conservative topics that appeal to the right side, I am leaving out the left side. In the same manner if I write about liberal ideals that cater to the left side of the spectrum then I am alienating the right. And since Triple B is for people of all political factions I do not take sides. Unfortunately recent events have made me feel the need to break the rules and write about some politics. As I am sure most people are aware the United States government has been in a partial shutdown since October 1. The shutdown is the result of the failure of the Congress of the United States to approve a budget before the start of the fiscal year. Now, I am not here to point fingers or place blame on either side since both sides share the blame equally. What I am hear to question is how a country like the United States can fail to pass a budget when one of the biggest jobs of Congress each year is to do just that. 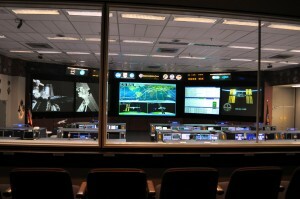 Mission Control at the Johnson Space Center is one of the many government facilities being impacted by the partial government shutdown. But for the first time since the Clinton administration the government is in a partial shutdown where only critical functions of the government such as the Military and the Postal Service are open while the rest of the federal assets including National Parks and NASA are idled. While negotiations continue to stall and reflect a governing body that is firmly entrenched along party lines around 800,000 Americans who work for the federal government are home without pay. Now, the lawmakers in Washington will be quick to point out that once a budget is passed the furloughed workers will receive all of the back pay that they are due. Of course, no one knows when that will be and in the meantime bills continue to pile up for the federal workers. The last government shutdown lasted a little under a month. It should be noted that the leaders in Congress responsible for the shutdown continue to receive their salaries. So in the midst of the finger pointing and back and forth discussions and blame gaming one would think that the President of the United States would be solely focused on finding a resolution to the stalemate that allowed those aforementioned 800,000 workers to return to their jobs and start earning money to pay those bills. While I want to believe that Congress really is trying to find a solution that allows your furloughed friends, family members and neighbors to return to work, recent events have me a little concerned as to whether the President is focused on the true priorities during these tense political times. I am of course talking about the President’s remarks about the Washington Redskins. 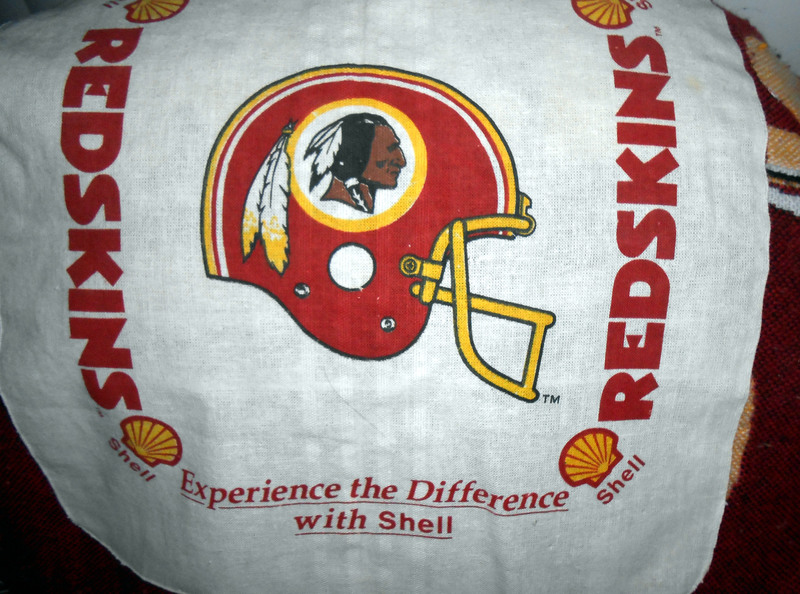 As I have written about before there is a small but vocal minority of people who have made it their mission to change the name of the Washington Redskins claiming that it is an offensive term to Native Americans. The football team that plays in Washington D.C. has been called the Redskins for around 80 years. The President of the United States recently joined a small minority of voices calling for that to change. Only one percent of Native Americans surveyed find the term offensive. 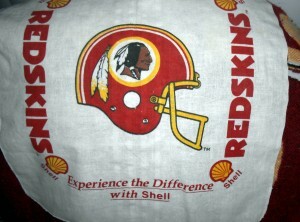 In fact, there are teams on Native American reservations that use the term Redskins for their mascot. For their part the Washington Redskins have stated time and time again that they have no plans to change the name that the franchise has had for 80 years. So by now you are asking yourself why I am bringing this up in the middle of a column about the partial government shutdown? It is being brought up because in the middle of the partial government shutdown where those 800,000 federal workers are home with no income while Congress plays the classic finger pointing heels dug in the sand game, the President of the United States found time to weigh in on the issue of the Washington Redskins name. That’s right, instead of focusing on the big picture and solving the debt crisis the President is quoted as saying words to the effect of the Redskins need to change their name. Now, I am sure that the President is able to multitask and am confident that he is focused on trying to end the stalemate and not just focused on things like the names of NFL teams which fall well outside the job description of Commander in Chief. After all, the President was elected to lead the country regardless of party affiliation. We are all Americans and with 800,000 of those Americans being held out of work as bargaining chips it is time for Congress to act in the best interest of the country and do the job they were elected to perform. Despite the questionable timing of appearing to care more about a team’s name than fixing a budgetary impasse I want to believe that the President and other elected officials are trying to find a compromise and let the political process work and not hold on to flawed ideals that there is no room for compromise. And while the Washington Redskins may be the home team that serves the Nation’s Capitol worrying about their name during a government shutdown is a little like playing the fiddle while Rome burns. 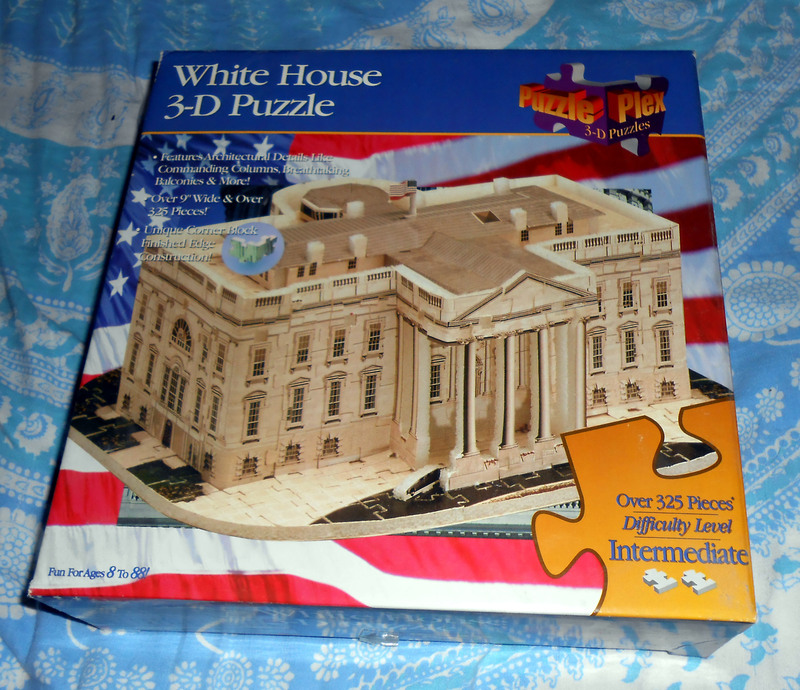 Now if you’ll excuse me, I have a model of the White House to assemble.